Azure Data Lake customers use the Data Lake Store and Data Lake Analytics to store and run complex analytics on massive amounts of data. However it is challenging to manage costs, keep up-to-date with activity in the accounts, and proactively know when usage thresholds are nearing certain limits. Using Log Analytics and Azure Data Lake we can address these challenges and know when the costs are increasing or when certain activities take place. In this post, you will learn how to use Log Analytics with your Data Lake accounts to create alerts that can notify you of Data Lake activity events and when certain usage thresholds are reached. It is easy to get started! Data Lake accounts can be configured to generate diagnostics logs, some of which are automatically generated (e.g. regular Data Lake operations such as reporting current usage, or whenever a job completes). Others are generated based on requests (e.g. when a new file is created, opened, or when a job is submitted). Both Data Lake Analytics and Data Lake Store can be configured to send these diagnostics logs to a Log Analytics account where we can query the logs and create alerts based on the query results. To send diagnostics logs to a Log Analytics account, follow the steps outlined in the blog post Struggling to get insights for your Azure Data Lake Store? Azure Log Analytics can help! 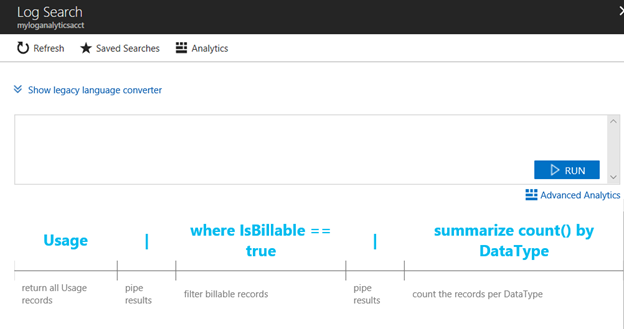 Specific key questions about the state or usage of your Azure Data Lake account can be generally answered with a query that parses usage or metric logs. To query the logs in Log Analytics, in the account home (OMS Workspace), click on Log Search. Queries that return individual events, these single events will show a single entry per row (e.g. every time a file is opened). Queries that aggregate values or metrics for a specific window of time as a threshold by aggregating single events (e.g. 10 files opened in the past five minutes), or the values of a metric (e.g. total AUs assigned to jobs). | where Category == "Requests"
| where ResourceProvider == "MICROSOFT.DATALAKESTORE"
| where Resource == "[Your ADLS Account Name]"
| where OperationName == "mkdirs"
| where ResourceProvider == "MICROSOFT.DATALAKEANALYTICS"
| where OperationName == "JobEnded"
| where ResultType == "CompletedFailure"
| where OperationName == "SubmitJob"
Queries like these will be used in the next step when configuring alerts. Step 3: Create an alert to be notified when the event is detected or when the threshold is reached. Using a query such as those shown in the previous step, Log Analytics can be used to create an alert that will notify users via e-mail, text message, or webhook when the event is captured or metric threshold is reached. 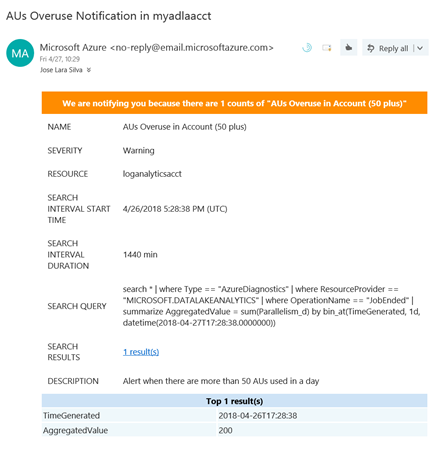 Check out this blog post for creating a new alert: Simple Trick to Stay on top of your Azure Data Lake: Create Alerts using Log Analytics. Please note that the alerts will be slightly delayed and you can read more details regarding the delays and Log Analytics SLAs in Understanding alerts in Log Analytics. Setting up alerts in Log Analytics can help you understand usage and manage costs as utilization increases. The process to set up alerts allows enough flexibility to adapt to your specific needs. Are you looking for a specific metric or usage activity? Reach out and let us know in the comments, or on our feature requests UserVoice. Check out the Azure Data Lake blog, where we regularly share updates and tips on how to get the most out of your Azure Data Lake accounts.